Enriching Your Home, LLC is a custom interior design company that is perfectly positioned to take your vision for your home and make it a reality. Invite us to your home for a complimentary design consultation. Because Home Is Who We Are. This beautiful living room is a wonderful example of elegant minimalism. Pastels, Seasonal Blooms and Plants create a naturally bright and inviting space. Choosing a color palette for accents - pillows, bedding and other accent pieces, such as wall art and botanicals is a fun and interesting way to freshen up your room decor. 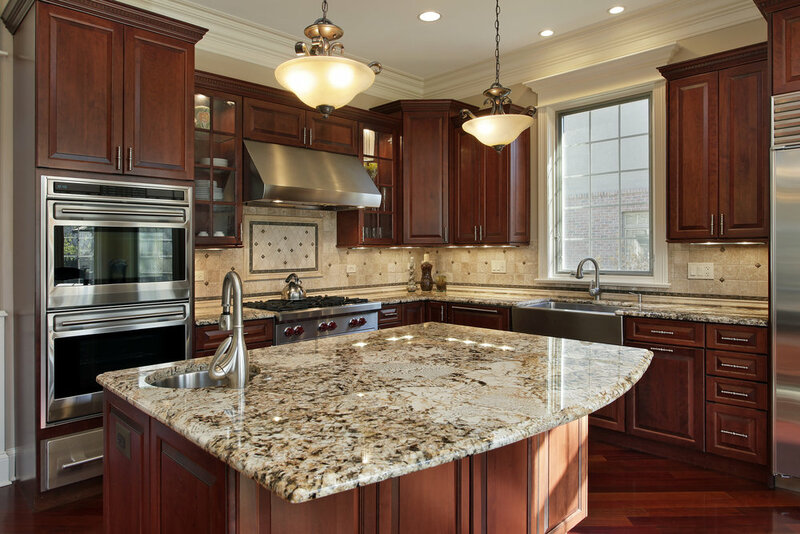 This kitchen features granite countertops and cherry cabinetry. A cozy space for a cold winter’s day - with gas fireplace on. Every holiday is a creative opportunity and enjoyable time to add decor and decoration to your home. Let Enriching Your Home create some special holiday magic for you. Here are examples of some of the decor/accent pieces which can be incorporated into your decor vision and project. Wreaths and swags are an easy , simple way to enhance any home decor. Wreaths and swags can be purchased in every price range, already made or custom designed. They are available for any color palette, season or holiday. It is easy to change them out as the seasons change. Hurricanes and Lanterns are very versatile decor pieces. Both come in a variety of styles and sizes, and are easily changed by using different fillers and candles. They are a great basic decor piece with so many affordable choices. The Hurricanes pictured have different types of seashells as fillers for Summer. Candles, both traditional or Realistic Flame Effect Candles (battery operated, can be set on timer or used with remote control) are a great way to set a mood, create an ambience or add to other decor pieces. Candles come in a wide array of colors and sizes, and are easily affordable. Vases, aside from be a holder for florals, greenery or botanicals, also make a design statement. Vases are another readily available decor item, in many styles, shapes and sizes. Arrangements can be high quality realistic permanent ones or fresh.